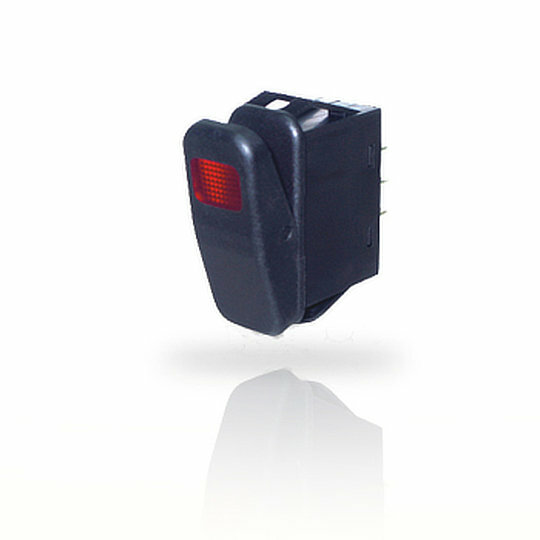 The KT series of sealed power rocker switches from ZF are single poles switches with single or double throw operation. Designed with snap-in mounting to fit panel cut outs of 36.8mm by 15.3mm and quick connect terminations for easy installation. Rated for AC and DC circuited the KT series has an electrical rating of 20A at 125VAC, 10A at 250VAC/28VDC and 21A at 14VDC and a mechanical life of 100,000 cycles. The KT series of sealed power rocker switches from ZF are single poles switches with single or double throw operation. Designed with snap-in mounting to fit panel cut outs of 36.8mm by 15.3mm and quick connect terminations for easy installation. Rated for AC and DC circuited the KT series has an electrical rating of 20A at 125VAC, 10A at 250VAC/28VDC and 21A at 14VDC and a mechanical life of 100,000 cycles. Available in both non-illuminated or illuminated actuators with the choice of 5 lens colours the KT series uses neon lamps for AC circuits and LED diodes for DC circuit switches. With an IP rating of IP56 the KS series is perfect for applications such as Control Panels, Lighting Equipment, Industrial Equipment and Off Highway Vehicles.